Double click the Computer icon on your desktop to open it. Click on the Computer tab within this window. 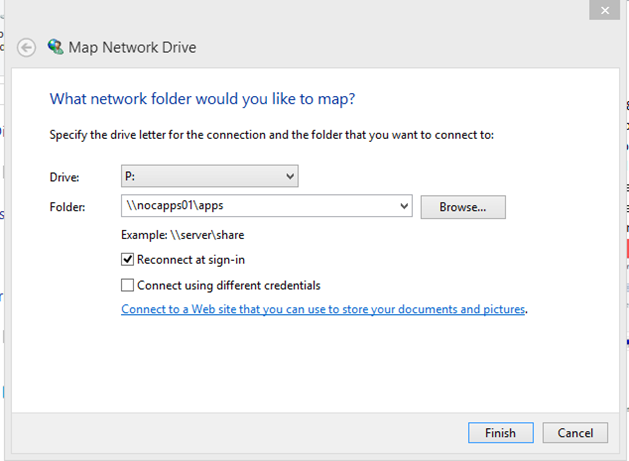 Click the Map network drive icon. Select a drive letter from the pulldown and provide the appropriate folder path. Check Reconnect at Sign-in. Click Finish. 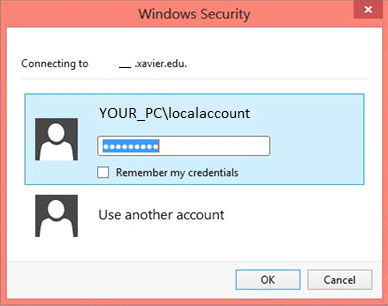 If you are connecting from a non-Xavier computer or a VPN, you will be asked to provide login credentials. You will need to login using the format xavier\yourusername as the username. If you simply type your Xavier username, the login will be rejected, and you will see a screen similar to the one below. If this occurs, click Use another account and try logging in again using xavier\yourusername. Repeat for all other drives you need access to. Your network drives will be listed under Computer.